Sturdy universal mount requires no drilling. 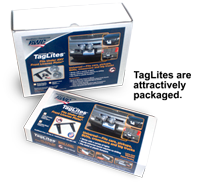 Align holes in License Plate with holes in TagLite™ universal mount. Then secure both to vehicle using existing screws. Attach lights and wire according to light manufacturer’s instructions.